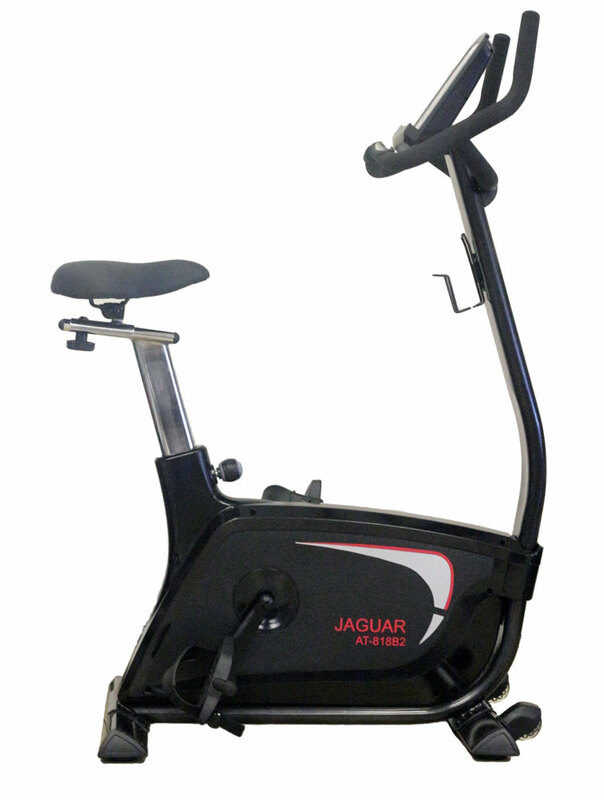 The Jaguar Commercial Bike is a premium upright exercise bike from aBlaze Fitness. Suitable for home and light-commercial use up to 180kg, the Jaguar is designed for a demanding semi-commercial environment with professional use. It's sleek modern look will blend into your modern studio décor and keep you, and your clients fit, in style. The Jaguar is one of the CATS range (commercial and trainer series) of exercise bikes - for others in the range, see the full aBlaze brand. Frame: Strong Steel frame with metallic black finish. Large, thick steel handle-bar with comfortable moulded vinyl covering. Strong Magnetic Resistance - 16 levels of magnetic resistance with automatic adjustment, controlled by you or the computer. Console: displays Speed, Time, Distance, Calories used, Watts, RPM, Pulse, Body Fat% and BMI. Console includes 12 in-built programs plus special iConsole+ programs including Beginner, Advanced, Sporty, Cardio and Watt modes. Console connects to iPad and Android mobile devices via Bluetooth - free app available to record workout history (iConsole+). Large, Padded, Saddle - for a more comfortable workout. The Saddle is adjustable - up/down, fore/aft, angle. Built-in wireless Heart Rate Receiver picks up your heart rate from Polar compatible chest straps (optional chest strap not included). Transport wheels - allows you to move the bike from room to room. Weighted pedals with foot straps - allows for easier use of the bike. Suitable for home and light-commercial use. National Warranty: Lifetime Frame, 12 months electronics and parts, 12 months in-home labour. Maximum User Weight: 180 kg. Assembled Size: 112 cm (L) x 56 cm (W) x 150 cm (H). Carton Size: 95 cm x 27cm x 66 cm. Buy aBlaze Jaguar Commercial Exercise Bike from Fitness Market and save! With our efficient dispatching and quick delivery throughout Australia, aBlaze Jaguar Commercial Exercise Bike can be yours sooner. Below you can rate and add reviews for aBlaze Jaguar Commercial Exercise Bike.